Take a leap and go from Manual testing into Automation with this new task. Start by downloading a project from Github and then look through the tests. By applying your knowledge of Manual testing you’ll be able to examine our coverage. 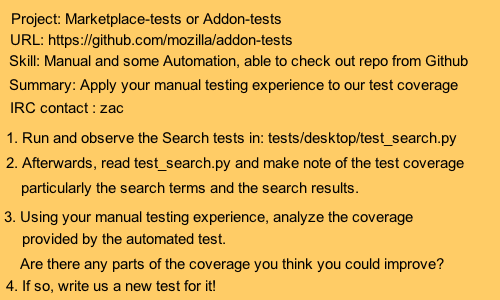 For suggestions on testing or information on this project, please contact zac on IRC in the #mozwebqa channel.